It's no secret that my gardening style is pretty different from that of my husband (aka the Mulch Man). In his area of our back garden, he is focused on recreating the lush, green Pacific Northwest look he fell for when he moved here from California back in the 80s. It has been a gradual process with several partial re-dos over the past few years, but the layout is finally working to his satisfaction. A month ago, we made some last tweaks to the beds and paths, and this past Saturday (taking advantage of our rainy Friday) we planted out all the residents from the Northwest Territory temporary nursery into the beds. The established huckleberries are full of glossy berries that contrast with the shiny leaves. I can't count the number of Bearberry (Arctostaphylos uva ursi) we now have, both the established ones and eight new ones. 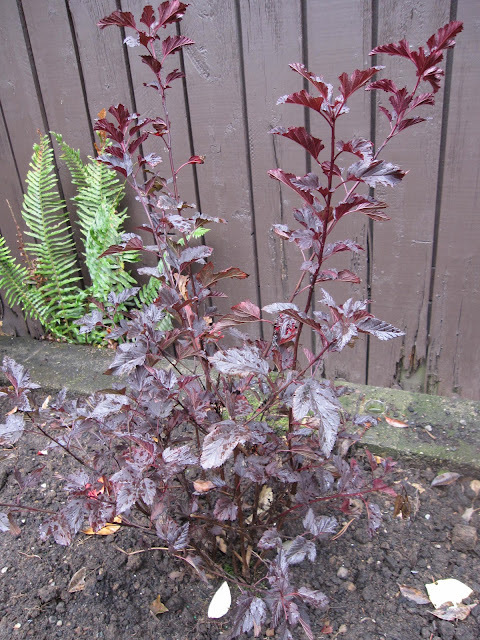 We moved some plants around, including this Mahonia nervosa. It didn't appreciate the amount of hot sun it was getting in late afternoon. The foxgloves aren't Northwest natives, but they have naturalized in the wild so we enjoy them in the Territory garden, too. The Mahonia foliage is getting that pretty purple coloration. I think it's partly from autumn, partly from sun stress and partly from being in a holding pot for a month. We moved a few small forbs to places where we can appreciate them better. Here are Iris tenax, I. x pacifica 'This Ring' and Sisyrinchium bellum 'Rocky Point' (I believe). I can tell the genus apart, but when they're not flowering, I'm not sure on IDing the species. We took out three 'Winter's Snowman' Camellias, because they just weren't doing the job in creating a privacy screen in the northeast corner of our back garden. To replace them, the Mulch Man decided on three Camellia sasanqua 'Yuletide". It's tricky to find an evergreen shrub that can withstand that area where they get no morning sun but bake in the late afternoon. 'Yuletide' were reliable and healthy in our last garden so we're giving them a try. That's a couple more huckleberries out in front of them, and our neighbor's blueberries in seasonal color behind the fence. It will take the camellias some years to get to any size, but the denser habit of 'Yuletide' is much better for the job of screening. A hybrid of the native Eastern Ninebark, Physocarpus opulifolius 'Summer Wine' adds a colorful note behind the Mountain Hemlock and will grow fairly quickly. It's hard to start over in an area that was recently green with shrubs, even if the overall result wasn't what we were looking for. But as I look at the space I try to imagine it in just a few years, filled with glossy, healthy foliage that beautifully screens us from the neighbors. I think it will complete the Northwest Territory and add a nice twist of Pacific Rim. And there's still lots of room for more foliage this spring! Foliage Follow-up is hosted by Pam at Digging. Pay her a visit to see other foliage stories for October. It's a transitional time in Portland, Oregon. A day of rain (our first real precipitation in almost four months) was followed by a cool and cloudy day, perfect for fall planting. I need to get on with more of that, but first let's look at what's still blooming in my Zone 8b garden on this mid-October Bloom Day. Agastache 'Acapulco Orange' wins the blue ribbon at Longview Ranch for longest bloom, easiest care and least water needed. It's been flowering non-stop since June. Cistus obtusifolius regularly pops out a few of its crinkly white blooms. It might bloom better if it got more sun, but the Pampas grass is so big now, it shades it part of the day. 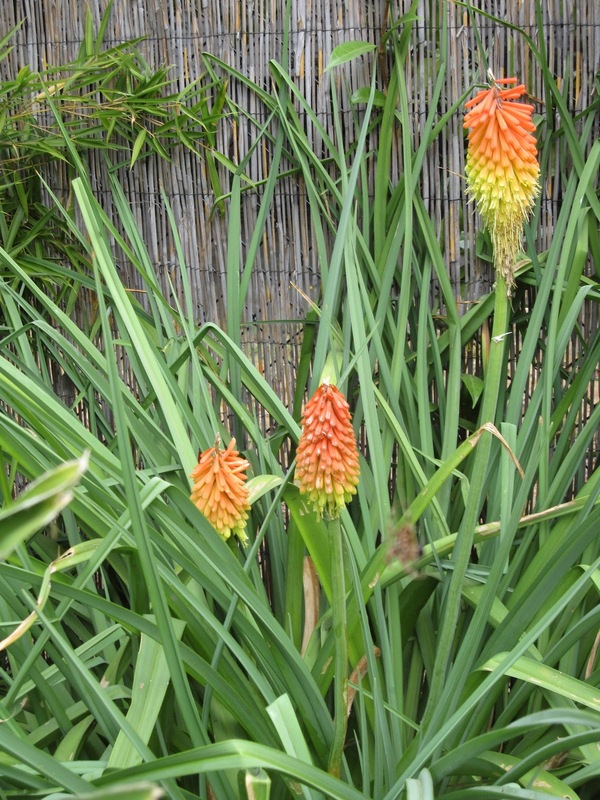 This month I realized the blooms of Kniphofia porphyrantha look just like candy corn - perfect for October. Phygelius 'Passionate' blooms on. Just yesterday, I saw a hummingbird feeding from its glowing orange tubes. Salvia guaranitica 'Black and Blue' still has a few beaky flowers. Its deep-blue blossoms look even more intense under a cloudy sky. Is there such a thing as too many flowers on a plant? I'm beginning to feel that way about this Abutilon 'Tangerine'. While I love the individual hibiscus-like blooms, and this shot near the top of the plant makes it look restrained enough, most of this short, squat plant is literally smothered in flowers. I should be grateful for such a non-stop bloomer, but if it doesn't make it through our winter, I won't shed too many tears. 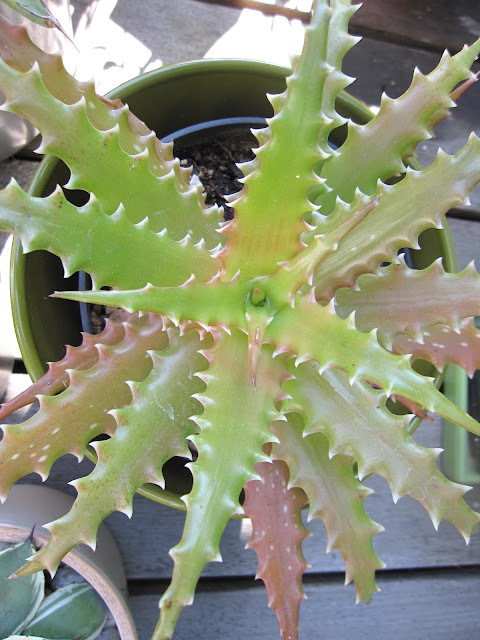 Our NOID Langerstroemia (possibly 'Catawba'?) is almost finished. I've been delighting in the rich golden blooms of Rudbeckia triloba, acquired from Scott of Rhone Street Gardens at our spring garden bloggers plant exchange. Also from our spring plant exchange courtesy of Ann (Amateur Bot-ann-ist), Campanula americana has flowered all summer. Each time I think it's finished, it comes back with a new flush of flowers. The latest ones are clustered tightly around the main stem I cut back earlier. And now it's time to get planting all my late summer acquisitions from various plant sales, nursery visits, and our garden bloggers fall plant exchange a week ago. Among those waiting in the wings is my last bloom for today, Tricyrtis formosana var. grandiflora 'W-Ho-ping Toad'. Bloom Day is graciously hosted on the 15th of each month by Carol at May Dreams Gardens. Click on over for a look at the flowers in gardens everywhere today. Here are a few random images from the garden on this bright, warm, early autumn day. 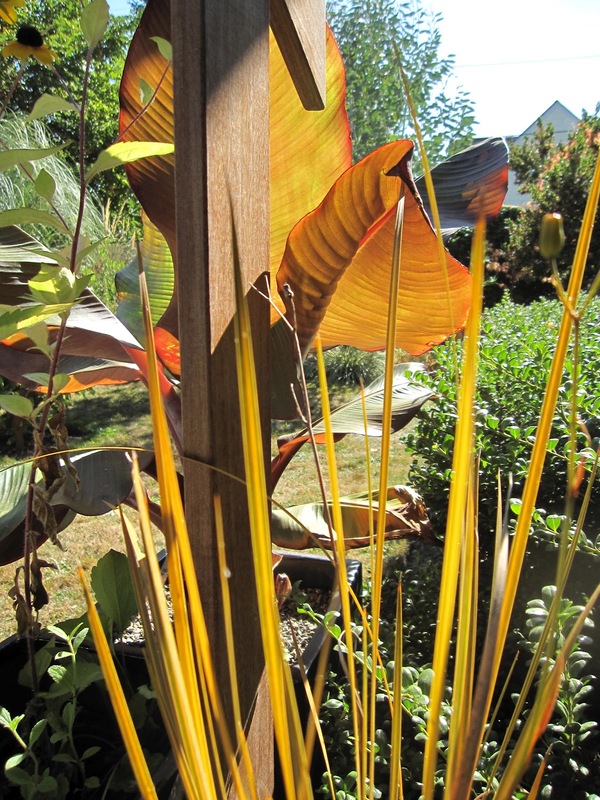 The sun shines beautifully through the leaves of Ensete ventricosum 'Maurelii' and Libertia ixiodes on my deck. After staying green in the shade most of the summer, the new growth of Loropetalum chinense 'Sizzling Pink' is emerging a rich plum purple. It's doing remarkably well for a shrub that has been moved at least three times and spent a few of its early years in a pot. Aloe dorotheae continues to regain her orange tones after being moved outside. I don't know if it's because of the increased sun, or the cooler nights, but one of those two stressors is doing the job. Plants from visits to Viscaya, Joy Creek, Far Reaches and the Xera open house (plus a few random acquisitions) are all waiting for wetter weather to be tucked in for winter. I couldn't resist another Arctostaphylos 'Martha Ewan', and A. 'Greensphere' is new to me. And I actually came home with Convolvulus cneorum - in late September. Just call me hopelessly optimistic. In the Northwest Territory temporary nursery, more shrubs await the rainy season to be planted. The Mulch Man reworked a few beds and rock borders, so huckleberries, foxglove and mahonia had to come out. They'll be joined by some additional huckleberries, several new Camellia sasanqua 'Yuletide" and Physocarpus 'Summer Wine'. As this seemingly endless summer winds slowly down, we've been enjoying eggplant and tomatoes from the garden. If you look carefully you can see the fruit of eggplant 'Ping Tung Long' (I love saying that name!) through the blades of Libertia peregrinans. I've been hearing rumblings of discontent about the continuing dry weather from some of my gardening blogger friends, and I seem to be alone in loving this weather. It just can't be too dry or sunny for me, so if this is autumn, bring it on!